Last Monday I finally shared the recipe for my Raw Tahini Dip – that same one I’m always snacking on in WIAW posts. And this week, I’m going to follow suit, with another regular player in the WIAW arena: my raw pulp crackers! Now, there’s a lot of recipes out there in Interland already – recipes that use leftover juice pulp as the base for crackers. There’s also plenty of recipes featuring nut pulp (left over from making nut milk), most often in cookies or macaroons. But this here recipe is unique, because it uses BOTH. Hey, at the rate I run through juice and milk, I gots a lot of pulp to process! 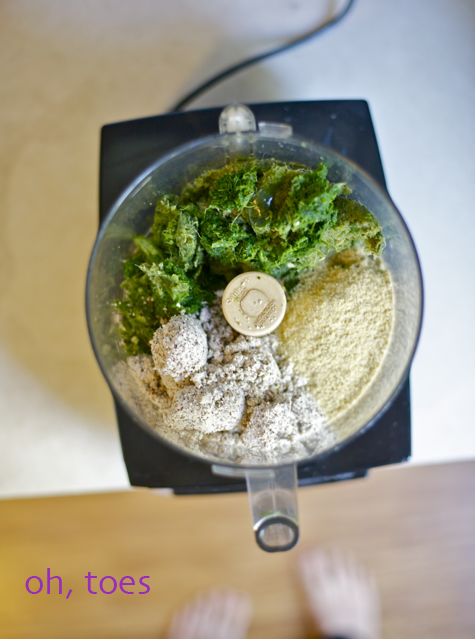 Place all ingredients in a food processor and mix thoroughly. You want it good and broken down, otherwise you’ll end up with long tough fibers in your crackers! Add more water to thin, if needed. Turn half of the “dough” out onto a lined dehydrator tray. 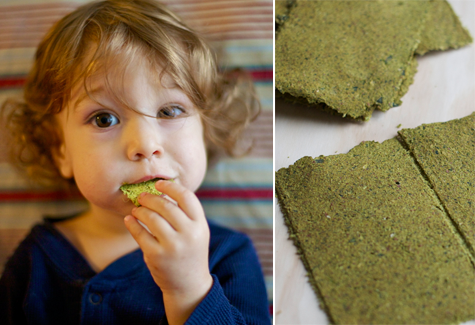 If you don’t have a dehydrator you can use your oven on the lowest heat, though the final crackers will not “technically” be raw (whatevs, they’ll still be tasty and nutritious!). 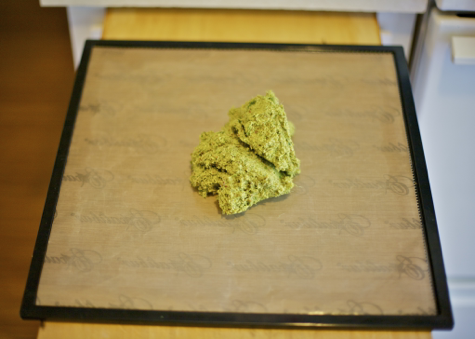 Just use a baking sheet lined with a Silpat or some wax paper. 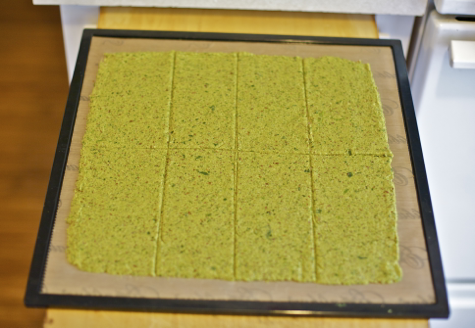 Use a spatula to spread the dough evenly over the sheet, then score it into the desired shape/size. Repeat with the second half, on another sheet. Dehydrate the crackers at 145º for 2 hours, then turn the temperature down to 115º and continue to dehydrate for another 8-10 hours. It helps speed the process along if you flip them after 4-5 hours, removing the non-stick liner. However, this is not necessary and you can totally just dry them overnight. If you use an oven they’ll take significantly less time, but I’m not sure how much, so you’ll just have to experiment. Keep an eye on them! And that, my friends, is that. 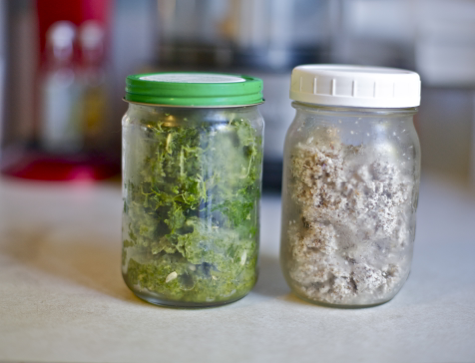 Once they’re dry they’ll keep for a few weeks in an airtight container in the pantry. And the best part about these crackers? oh… time to buy a silpat! What dehydrator do you use? How pleasantly green! I need a juicer and a dehydrator. What is the highest temperature still considered raw? Just gotta say…I’m a sucker for those big brown eyes! Waits is such a cutie! Thanks for this, I’ve been making raw juice pulp crackers for a while but I never thought to add the nut pulp – will be trying this for sure! I was just thinking about how to make the raw crackers you mentioned – didja read my mind?? Totally unrelated, but I will be in Seattle in November -w hat do I need to see?? i am so flipping excited about these! i cannot wait to make them…i don’t have a dehydrator (although i found a few plans for solar powered ones…now all i need is a backyard) so i’ll be experimenting with the oven set on low. thanks for this! I live in sunny, dry Colorado, and have even built a solar dehydrator…and I don’t think it would work well enough to make them completely dry. I make crackers similar to these in my dehydrator, but with sprouted beans and nut pulp, and if they don’t get REALLY dried out, they taste fermented, and not in a good way. So not to say you shouldn’t try, but if it was me, I’d go for the oven option if I didn’t have a dehydrator. I’m quite excited about trying Sayward’s recipe. Hopefully it will be like my cracker recipe, which seems impossible to mess up, even though the ingredients are always quite different. It always tastes just great! I advise going slow with adding water if you’ll be dehydrating–it increases the time a lot. Oh I am so glad you posted this recipe. I have been stalking..correction waiting patiently for it as I love seeing them on the WIAW posts. Is there a substitution for the nut pulp for people who are allergic to nuts? Hi Lydia, oh man, I wish I knew Seattle better! But other than Pike Place Market, I’m pretty lost. Sorry! Cute kid. Think I’ll try this recipe next time. No dehydrator so will use a low oven setting.